Farmers across Minnesota are starting to take to the fields to harvest their crops. We want all of our farming friends and their families to be safe and stay healthy during this busy and prosperous time. Please follow these farm safety tips and health guidelines. Happy Harvest! We all know that sharing the roads with other vehicles during harvest can be, well, challenging. 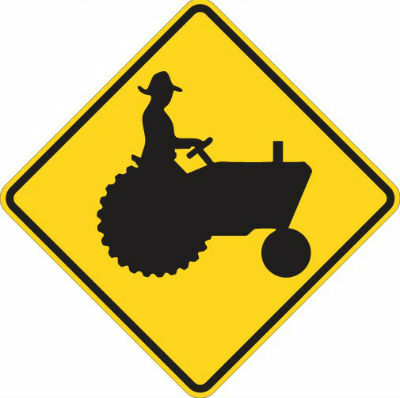 Drivers who are in a rush are not patient or careful, and accidents involving farm equipment can be dangerous. Be prepared and drive safely! Watch for drivers who may not be watching for you. Use your lights and flashers to ensure others see you coming. Keep an eye out for animals, especially around dusk or dawn; they are on the move as fields are being harvested. Use slow-moving vehicle emblems if your equipment is traveling under 30 miles per hour. Consider using a following vehicle when transporting larger farm equipment on roads. Harvest Farming is physically demanding and long hours can take their toll on our bodies. That physical stress contributes to accidents and even death. It is important for farmers to follow some basic health guidelines when beginning fall field work. Take Breaks – If you are spending long hours in the field, take time for short breaks. It may seem unproductive, but it is good for YOU. Slow Down – It only takes a few minutes to run safety checks on your equipment. A few minutes that could save your life. Get Enough Sleep – When you are working long hours, it can be hard to find the time to get a good night’s sleep, but falling asleep behind the wheel can have drastic consequences. Practice Healthy Eating – Take the time to eat. Grab a bite in the morning, pack a cooler for lunch and supper or ask a family member to deliver a meal. They’ll be excited to visit you! Make sure your meals and snacks are healthy and give you the nutrition you need to keep going. Relax a Bit – Take a minute to relieve stress. Enjoy the beauty of the season. Listen to music, take a walk (even if it’s just from your combine to the farm site) or play with the kids. It’s worth it to restart your mental clock. Farm families work together and during harvest, farm kids are often riding in farm equipment and helping out where needed. This is a wonderful lesson in hard work but can also be very dangerous! Here are some farm safety guidelines to protect kids. Watch for kids when driving, they are hard to see and often times not looking out for you. Turn equipment off, lower hydraulics and remove the key when not in use, even just for a short period of time. Younger kids especially love to “drive” and want to be just like you. Designate a specific play area. Be proactive and put a fence around your swing set and sand box. It is the best way to let your kids enjoy the outdoors and be safe. Keep an eye out for safety hazards around the farm. Keeping things cleaned up and put away can be very important. Then there’s nothing for them to get into. Watch kids diligently. This can seem like a no brainier but make sure if kids are outside that someone is with them and watching them closely. Assign kids age-appropriate jobs to do. It’s great to have them involved and learning but always have an adult there to supervise. Talk to them about the dangers of the farm. Education is important, don’t just assume they know. 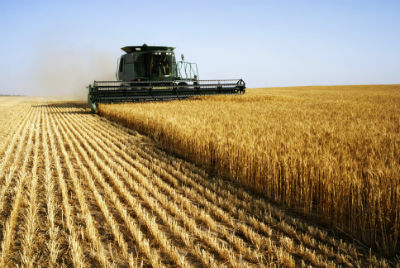 Review farm safety often especially before or during harvest. Take extreme caution when letting kids ride on farm equipment. They enjoy being in the combine or tractor with you but be sure to be safe. Keep them in a seat with a seatbelt, do not leave them unattended even for a minute and if you find yourself distracted, send them home. Farm equipment is powerful and dangerous. Many farmers are injured each year. Take safety seriously and take the time for safety checks. EVEN during your most busy times. Keep kids and farm visitors away from machinery unless an experienced person is present. Take time prior to harvest to review safety information. Read manuals and warning decals. Inspect and clean all equipment properly. Stay away from moving parts when operating and fixing equipment. Don’t value saving time over saving your limb or life. Shut down equipment completely before getting out. Turn off the engine and remove the key. It’s best for your safety and the safety of others. Famers handle lots of grain during the harvest season. Grain storage bins and handling equipment can be dangerous. Take these precautions. Lock entrances to grain handling areas. Wear high quality, dust-filtering respirators in necessary areas to protect your lungs. Properly clean all grain handling equipment. Install ladders inside bins in case of an emergency. Do not enter grain bins unless absolutely necessary and never when they are being loaded or unloaded. Use a safety harness when entering a bin. Shut off and lockout power and always have someone waiting outside the bin to help you out if problems arise. The Corn Capital Innovations Team wants to wish you all a safe and prosperous harvest this year. Then it’s time to start planning for the future. Please contact us if you need help with next year’s cropping plan. Back in October, I was flying high after purchasing a drone for use at Corn Capital Innovations. Just like a kid on Christmas, I was excited to play with my new toy! But our drone is much more than just something shiny to fly around, it serves two important purposes to our business. It’s a great tool for use during our agronomy work. It’s another set of eyes for us to see what is going on in our customer’s fields. 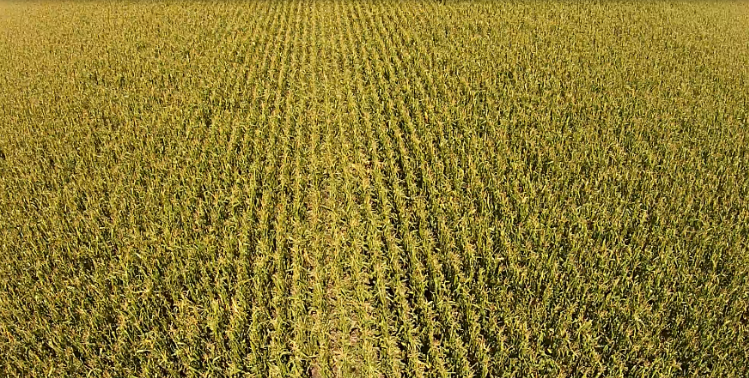 Watch this video of our drone in action during the 2014 corn harvest. 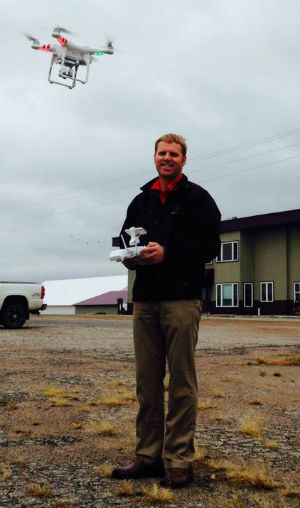 Interest in using drones in agriculture is growing. Here are some benefits of using a drone for farm operations. Checking on your plants’ progress and determining if they need more attention is quicker and easier using a drone. Using a drone effectively can save you time and money. The use of drones in agriculture is still in its early stages. Here are some promising future uses for drones on your farm. Please take a few minutes to read these additional resourses and further educate yourself about the use of drones for agriculture. Let our experienced team help you determine if you need to take action in your production strategies using cutting edge technology like drones. Please contact us at (320) 523-2252! Have you considered using a drone in your operation? Do you have any questions we could answer about the use of drones? At Corn Capital Innovations of Olivia we learn from 2013 to create more opportunity in the 2014 season for your farming operation. The 2014 planning process should start now. Let us help! Check out our website and let us give you A Great hand in farming.